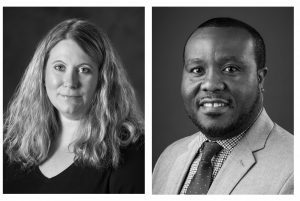 The Chattanooga Theatre Centre has appointed two new members to its board of directors, each of whom brings valuable professional and personal skills to the non-profit organization’s governing board. Newly elected to the board are Angela Griffin, a capital administrator of Tennessee American Water, and Darian Scott, Community Outreach Coordinator for the Chattanooga Area Chamber of Commerce. In her professional role, Griffin’s responsibilities include coordination between departments to deliver Tennessee American Water’s capital budget each year. She started her career with the American Water company in 2005 and has served in a variety of roles.Griffin has earned several IT industry certifications, including Project+ and Security+. Additionally, she is a certified Cisco Networking Associate. She is also active in her community as a mentor for tnAchieves, the partnering organization to the TN Promise Scholarship, which works to increase higher education opportunities for Tennessee high school students by providing last-dollar scholarships with mentor guidance. She is also an active volunteer at the Chattanooga Theatre Centre. In his role at the Chamber, Scott works with the talent development team to help prepare Chattanooga’s youth for the challenges of entering the workforce by organizing and delivering career readiness programs to Hamilton County School students in grades 8 through 12. He also works with businesses in the community by organizing job and career fairs and helping to connect local employers to potential workers. Scott is the founder of Minority Connection, a networking group aimed at connecting and encouraging business‐to‐business relationships in the African American community. He also serves on the committee for Youth Leadership Chattanooga and on the Board of Directors for SoundCorps, a nonprofit dedicated to growing the music industry economy in the region. Founded in 1923, the Chattanooga Theatre Centre is one of the oldest and largest community theatres in the Southeast and produces high-caliber theatrical productions and provides volunteer and educational opportunities for people of all ages.